St John Ambulance is the name of a number of affiliated organisations in different countries which teach and provide first aid, emergency medical services, primarily staffed by volunteers. The associations are overseen by the international Order of St John and its priories (national branches). The first such organisation to be founded was the St John Ambulance Association, which was founded in 1877 in England. Its first uniformed first-aiders were founded in 1887 as the St John Ambulance Brigade. These two have since been merged into a single association. St John Ambulance now have over 40 national organisations, many of which are affiliated with Johanniter International, and over 500,000 volunteers worldwide. The Order of St John owns the brand name. Logos may vary in each country but always contain the eight-pointed white Maltese cross on a black background as the essential identifier. Like the Order, St John Ambulance associations accept members of all religions. Their geographic organisation differs from the Order, and they have to contend with the differing national laws, medical practices and cultures of countries. As a result, the role and organisation of St John Ambulance varies by country. The legal status of each organisation varies by country, province, state, county, territory and municipality. In both England and Wales the resident St John Ambulance organisations are simultaneously but separately registered as charities and companies, whereas St John Ambulance South Africa (for example) is a distinct entity registered as a "public benefit organisation". St John Ambulance were traditionally organised with military-style ranks. Some associations have replaced these with civilian titles (e.g. Unit Manager, Superintendent). In the aftermath of World War II, British soldiers established Saint John brigades in Germany. In cooperation with the Johanniter Orden (the Protestant German Order of Saint John), the Johanniter-Unfall-Hilfe was founded in 1952. In recent years, more national Saint John societies, not directly linked to the British St John Ambulance, have been founded in Europe, notably in Austria, Denmark, Sweden and Poland. At the international meeting of the governing bodies of the Orders of Saint John in the course of celebrations to mark the Order's 900th anniversary in 1999, the idea to cooperate more intensively within Europe was born. As a result, Johanniter International (JOIN) today links sixteen national Saint John organisations all over Europe. Logo of the Order of St John. The Order of Saint John, formally the Most Venerable Order of the Hospital of Saint John of Jerusalem is an international order of chivalry which is headquartered in the United Kingdom. 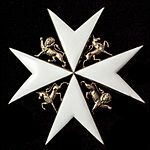 The Order founded the St John Ambulance associations and oversees their work. They also own the rights to the St John name and brand, including the Maltese Cross logo. The Order also oversee the St John Eye Hospital Group, which is separate to the ambulance associations. Most members of St John Ambulance are not themselves members of the Order, and vice versa, so a major presence of the Order does not dictate a major presence of St John Ambulance. 1908: By mutual agreement with St Andrew's Ambulance Association, St John Ambulance Association ceased operating in Scotland but the Order continued to operate. The St John logo appears on the right door of several models of the TARDIS in the long-running British series Doctor Who. This was copied from British police telephone boxes, from the 1970s and earlier, the larger versions on which the TARDIS is modelled contained a folding canvas stretcher and a first aid kit provided by St John Ambulance. These boxes pre-dated universal radio communication and enabled both patrolling police officers to contact their station and members of the public to call for assistance. If a call came in for the officers the blue light on the roof would flash. The St John logo also appears on the windows of a hut dedicated to first aid at a Church Fair shown in an episode of Jeeves and Wooster. In 2016, the UK St John Ambulance organisation, via its website, launched a campaign for baby CPR featuring a song by animated nursery rhyme characters, including Humpty Dumpty, Jack and Jill, Incy Wincy Spider and The Cat and The Fiddle. ^ a b "History in Summary". St John International. Retrieved 12 May 2017. ^ a b c The Difference - newsletter from St John Ambulance, (Nov 2014) p4 "A Brief History of St John Ambulance"
^ M Durrant (1948) American Journal of Nursing 48 (12) pp763–765 "St. John Ambulance Brigade"
^ "Jeeves and Wooster (1990-1993): The Village Sports Day at Twing". IMDb. ^ Harris, Kelly (23 January 2016). "St John Ambulance launches nursery rhyme-themed campaign to teach baby CPR to parents". Dudley News. This page was last edited on 18 April 2019, at 17:56 (UTC).